Sunburn blisters are raised, fluid-filled bumps on the skin caused by over exposure to the sun’s harmful UV rays. Sunburn blisters are uncomfortable and can even be extremely painful and itchy. 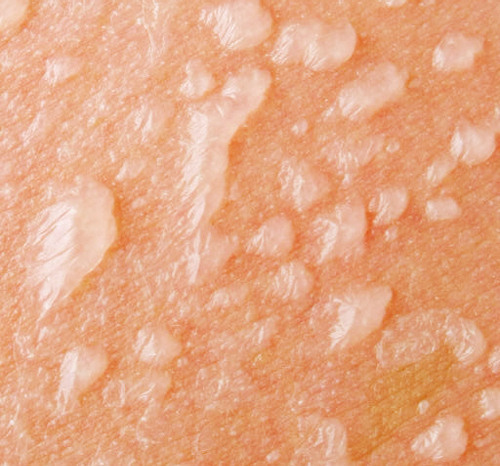 Sometimes these blisters lead to skin infections that can cause more pain, swelling and a fever. 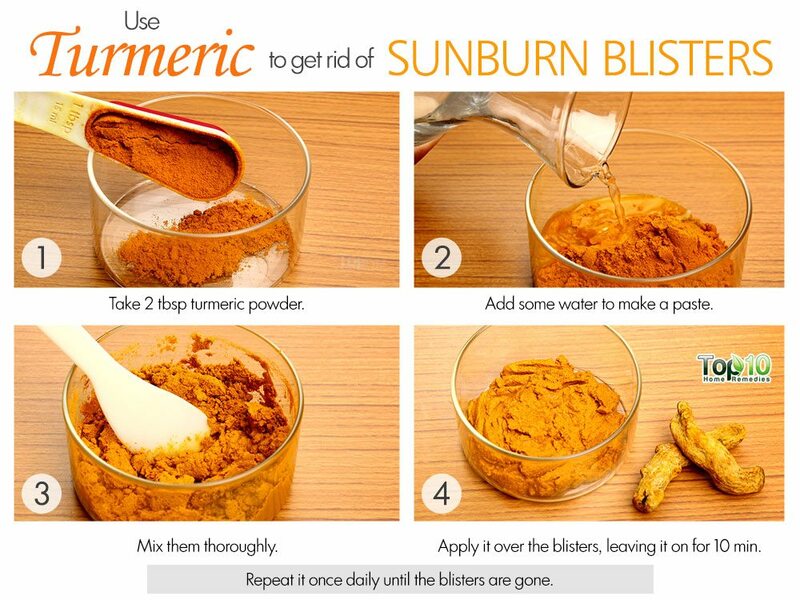 Sunburn blisters often can be treated with some simple and easy home remedies. Home treatment can help decrease pain, prevent infection and speed up the healing process. 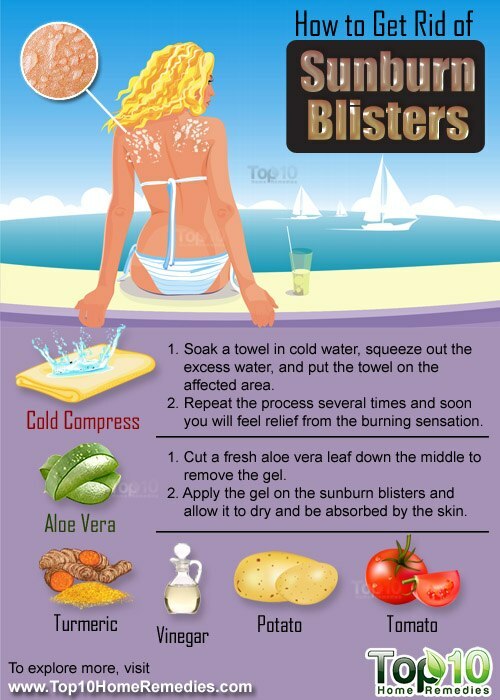 Here are the top 10 ways to get rid of sunburn blisters. You can reduce the inflammation and get significant relief from the pain of sunburn blisters by using cold compresses on the affected skin area. Soak a towel in cold water, squeeze out the excess water, and put the towel on the affected area. Repeat the process several times and soon you will feel relief from the burning sensation. Never apply ice directly to sunburn blisters as it can worsen the condition. In addition, it is recommended that you not take warm baths for a few days. Bathe in cool water instead. It will also help alleviate the pain. Aloe vera is known to be a very effective natural cure for minor burn injuries including sunburn blisters. It will help reduce pain, re-hydrate burned skin and also speed up the healing process. Cut a fresh aloe vera leaf down the middle to remove the gel. Apply the gel on the sunburn blisters and allow it to dry and be absorbed by the skin. If fresh aloe vera is not available, you can use an aloe vera gel available on the market. Both white vinegar and apple cider vinegar are helpful in treating sunburn blisters. 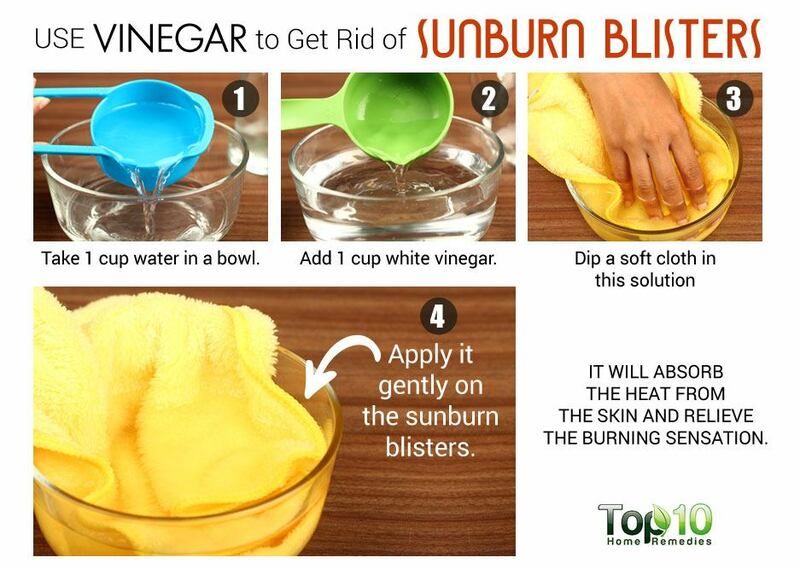 Dilute some vinegar with cold water, dip a soft cloth into the solution and apply it gently on the sunburn blisters. It will absorb the heat from the skin and relieve the burning sensation. You can also spray vinegar directly on the affected area to ease the pain. Another option is to mix equal amounts of honey and vinegar and apply the mixture on the affected area once daily to prevent infection. Oatmeal can also be used to treat sunburn blisters. It helps soothe the skin and promotes healing. Take an oatmeal bath. Fill a bathtub with cool water and add two cups of powdered oatmeal. Soak your body in this bath for half an hour or more. For better results, you can add rose petals to the bath water. Another option is to wrap one cup of ground oatmeal in a cotton or muslin cloth and boil it in water for a few minutes. Allow it to cool and then use it as a sponge while soaking in cool bath water. Turmeric has antiseptic as well as healing properties that help alleviate pain and inflammation associated with sunburn blisters. Mix 2 tablespoons of turmeric powder with some water to make a paste and apply it over the blisters, leaving it on for 10 minutes. Another option is to make a thick paste of turmeric powder, barley and yogurt and apply it generously over the affected skin area. Leave it on for about a half an hour and then wash it gently with cold water. Repeat the remedy of your choice once daily until the blisters are gone. 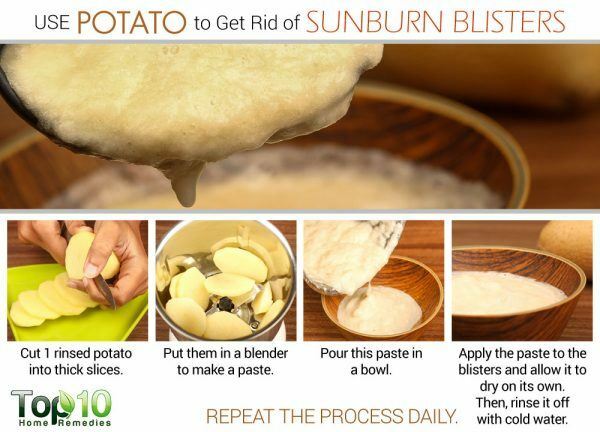 Raw potatoes help cool the skin, reduce the pain and also speed up the healing process. Rinse one raw potato thoroughly and cut it into thick slices. Put them in a blender to make a paste. Apply the paste to the blisters and allow it to dry on its own. After it dries, wash it off with cold water. Along with potato, you can also apply slices of cucumber on the affected parts of the skin. 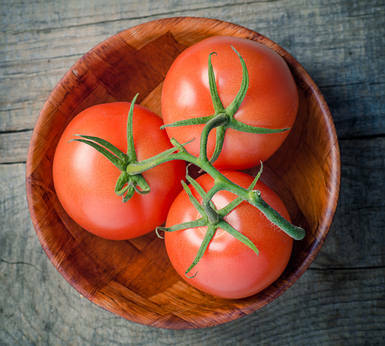 Tomato juice is highly beneficial for treating sunburn blisters. It can alleviate the constant burning sensation and also promote faster healing. 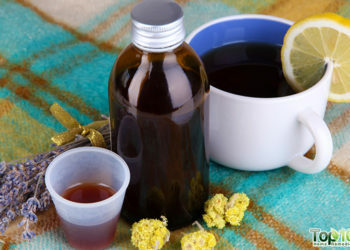 There are many ways to make use of this remedy. Mix one-fourth cup of tomato juice or tomato paste with one and one-half cup of buttermilk. Apply the mixture on the affected skin area and leave it on for half an hour. Wash it off with cold water. Another option is to add two cups of tomato juice to your bath water and soak your body in it for 10 to 15 minutes. Alternatively, you can mix one mashed tomato with some crushed ice and gently apply it over the affected area to get relief from the pain. 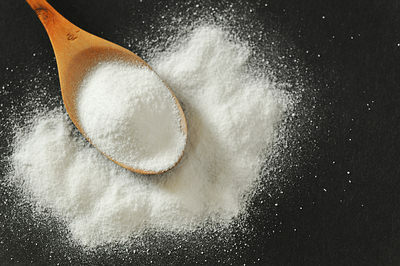 Baking soda is alkaline in nature and can be very soothing to the skin. It also has antiseptic properties that can help relieve the itchy feeling that often occurs with sunburn blisters. Fill your bathtub with tepid water and add one-quarter cup of baking soda. Mix it into the water well. Soak in the water for 15 to 20 minutes. For instant relief from the burning sensation, you can mix one teaspoon of some baking soda in a cup of water and apply it over the affected areas. To speed up the healing process, you can apply a paste of baking soda mixed with vinegar onto the blisters before going to bed. 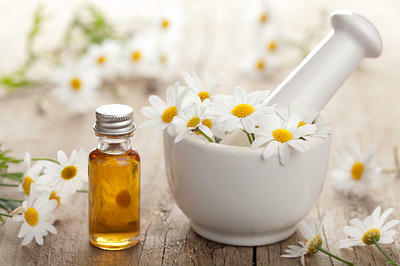 Chamomile can be very helpful in relieving sunburn blisters and the accompanying symptoms. Add a few drops of chamomile oil to one tablespoon of almond oil. Apply it on the blistered area. Repeat the process once or twice a day to get relief from pain and itchiness. You can also soak a few chamomile tea bags in ice water and put the tea bags on the blisters for a cooling effect. Lettuce is very beneficial in combating the pain and inflammation of sunburn blisters. 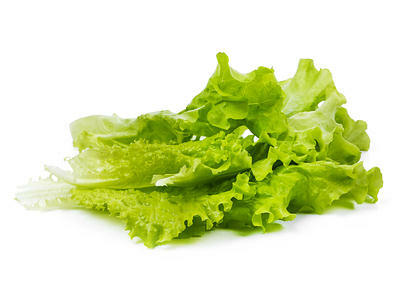 Boil a few lettuce leaves in water for about 10 minutes. Strain out the leaves and put the water in the refrigerator for a few hours. Apply this cold water to the blisters several times a day. You can also put lettuce leaves in the refrigerator and put the cold leaves directly on the affected skin area. Repeat this several times a day until the blisters are completely gone. These remedies will ease the pain and discomfort associated with sunburn blisters. But if your symptoms do not improve in a few days, seek medical help. I live in Canada and its finally getting warme so I decided to go outside and I got a sun rash 🙁 . My prom is in a month! I need help fast! I don’t have severe blisters but I have many tiny pimples around my stomach caused by the sun. Any fast-relieving remedies? You can dip a towel in cold water, squeeze out excess water, and put cloth on the area of blisters. Also try aloe Vera. Put the aloe on the blistered area once a day or however many times needed. This is like blessed relief. Thank God for these remedies!! I feel one hundred percent better!! Thanks a ton!! My children and I were playing on our secluded beach in Santa Cruz, CA and we got BADLY sunburned! My daughter was crying because her whole body was covered and my sons were whining. I did the black tea remedy (20 black tea bags in a bathtub of cool water) and it eased the pain. Did most of the suggestions here and now my triplets of five (almost six) years old are in the backyard, begging to go to the beach again. I think we’re gonna go for a walk down there now! – Alexei Minoi, Charlie Minoi, Maxine Minoi and Collin Minoi. Put sunscreen on your kids. Exactly! My son started detassling and I put sunscreen only on his face and nose not his neck and back of neck he was wearing a long sleeved shirt I felt like a horrible mother! How could I possibly forget those areas and now he’s sunburned with blisters ! It’s all my fault! My poor baby! I was out fishing and didn’t put any sunscreen on because it was cloudy outside. Well, I learned the hard way that even though it’s cloudy outside doesn’t mean you can’t burn. Hopefully these remedies help thanks! Yah i hate using sunscreen bc i want to get a tan. But when i do put it on i keep forgetting to reaply it every 30 min and i got a huge face sunburn and i love to impress. I am in Hawaii so it is very hot and sunny here. Stupidly I spent almost 8 hours total in the sun without sunscreen, and now my whole back is covered with water blisters that sting a lot. I hope these remedies work fast because I’m going camping in less than a week. got sun poisoning a few days ago and 2 days later after I got the heat out I find that Neosporin is helping the process. Will any of these remedies work for sun blisters on the lips? I am so uncomfortable. Using neosporin and herpicin l from Cvs for two days now with little relief. I am hoping something will work soon. There is truly only one thing that works for me and most people that get blisters on the lips. That would be Zovirax ointment and Zovirax also in pill form. I hope this helps. I tried the baking soda bath and oatmeal bath. I’ve also been putting a cold compress on my blisters. I see them slowly healing. Like a stupid person I was swimming all day and I got sunburn at first but now I have blisters and I really want to go swimming need help fast. Like a stupid person I was swimming all day and I got a real bed sunburn…at first it was just real red, but now I have blisters on my nose and on my cheek and I really want to go outside and go swimming i need help to get rid of it…how do i get rid of it he fastest possible?? Put raw sausage patties over the blisters. This has worked for me in the past. I’m going to go out on a limb and say that’s not the right thing to do. Raw meat of any kind has bacteria in it. I went to swim with dolphins and the trainers said no sunscreen it’ll hirt the Dolphins well we were in there swimming for 5 hours. You could imagine how I looked after. Aloe Vera kinda eases the pain but not really I’m gonna take a cold bath now maybe it’ll help the pain. This is a nice list, however my blisters don’t hurt or itch do the remedies for pain are useless. I wish they would be superadded better because it’s hard to tell which ones are just to help with pain, and which ones are for actually helping it heal. i love your plans my daughter had really big blisters on both of her shoulders she couldn’t even sleep last night but then we went to this web site and we did one of your trikes and it worked thank you so much for making this website. I’ve tried the baking soda-vinegar combo and I left it on my shoulders over the night. I need help I have sunburn from swimming and the next day I had a big blisters on my shoulders . They hurt so much and I need to now what can help stop the burn and get rid of blisters off my shoulders.